"Nyotaimori" (freely translated means "female body plate") is the name of a restaurant in japan which provide sushi and sashimi on the naked female body. 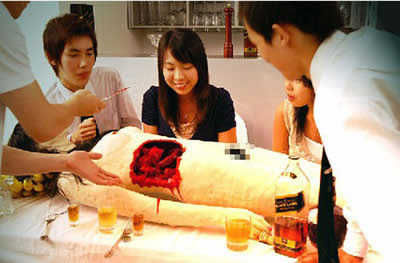 [Do not mupeng first] 'body' of food and placed on the operating table, as in the hospital. You can "operate" in any way and anywhere the you want to rip open the body and eat whatever you find inside. The body will "bleed" when you are torn and in all organs can be eaten. This is the Banquet of Cannibalism. Did you hear the people who eat in the bathroom or toilet and get the fun? Restaurant named Marton Theme Restaurant, located in Kaohsiung (Taiwan) has a toilet theme and attract visitors. This restaurant has a bathroom decor, with a colorful toilet seat Warni as standard in this restaurant. Visitors sit around a table in the bathtub with a glass kover and can see the walls decorated bibcock neon disposal and pipes made of decorative lights. This restaurant is very tune visitor. Owner, Eric Wang said, "We not only sell food, but also a sense laughter. Same food as our other restaurants, but we provide a more fun. Many customers think, the more unsavory and repulsive (the restaurant is), the more enjoyable experiences Diner. " 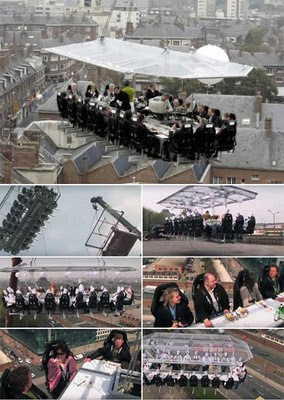 "Dinner in the Sky" is a restaurant in Brussels, which provides meals for up to 22 people can be,, 150 feet in the air! Tables and chairs designed specifically, with a crane. You specify your own location, we hoist you into the air. Eating anywhere across Belgium will be in charge 8000 euros. Other locations also available. Remember, you must use a seat belt, and do not drop your fork! The first dark restaurant in Asia, officially opened on 23 December 2006. This is a restaurant, is located in beijing, china, which has interior be painted completely black. 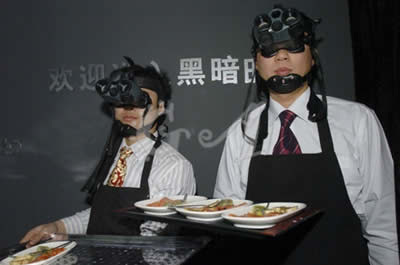 Customers enter through a hall which is very light, and the waiter will be guided by using night vision goggles (ky cool in game) to eat in the pitch-dark room. Flashlight, cell phone, and even a wristwatch that can go around in the dark, this is prohibited in the area. Food will be placed on the total environment, which is not visible. it's totally in the darkness. When you ask about the bathroom, do not worry, they have a light in the bathroom. 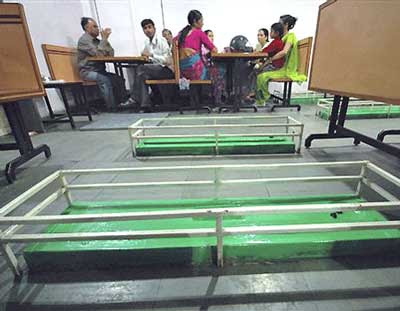 "New Lucky Restaurant", located in Ahmadabad, famous for tea, butter cakes, and graveyard between restaurant tables. Krishan Nair Kuti has been for several decades running a restaurant, built on the graves are hundreds of years, but he certainly did not know anyone who is actually buried in the floor. Customers seem to like the graves, a small cement-shaped headstone. "the luck is on the grave" Nair said on the sidelines of the business. "Our Business is becoming increasingly well because there is this grave." All gravestone be painted green, and every day, the manager decorates each gravestone with dried flowers. 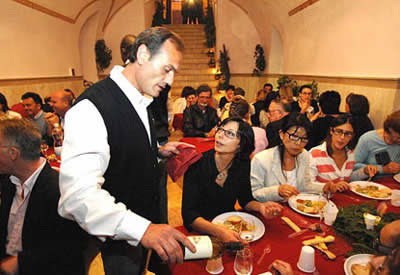 A restaurant that is located in a top security prison, Fortezza Medicea in Italy, very popular. Piano playing accompanied by Bruno, a pianist punishment life imprisonment for murder, customers enjoy eating in the chapel which is located behind the prison walls at 60 feet, decorated by tower, spotlight, and security cameras, in the Fortezza Medicea that have been aged 500tahun, located in Volterra, near Pisa. Always in the strict supervision of armed prison guards, the team includes 20 sturdy chef, interpreter kitchen and waiter, Diner prepare up to 120 shares to customers who have been through strict security checks. People may be confused how this can be paired Tionghoa busy running a restaurant business for 21 hours a day without tired. 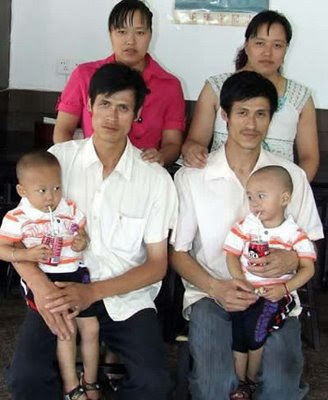 In fact, the restaurant is managed by two pair .. both men and women twin! Of the local tavern is named "robot couple restaurant" because they were not thought out how to couple a pair of working endless hours of 6 am to 3 hour morning the next day! However, journalists from the newspaper Today Morning Post interviewed the restaurant and found the incident was. In fact, twin men marry twin women from the same city three years ago, and moved to Yiwu to run businesses and restaurants along with this. "Many customers think our work like robots, but they did not know that we actually four" said Mao Zhangzhua. 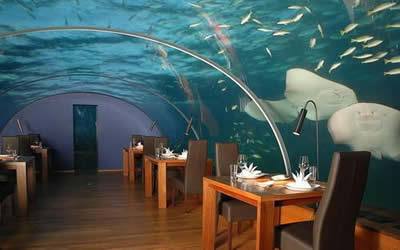 The first restaurant under the sea in the world, introduced at the Hilton Maldives Resort & Spa in April 2007. Named Ithaa (pronounced "eet-ha" which means "pearl") is located 5 meters below the surface of the Indian Ocean, surrounded by beautiful coral reefs and protected by a transparent acrylic, offering dinner with the bottom of the sea is beautiful. This innovative restaurant is the first in the world, and is part of the project of 5 million U.S. dollars in rebuilding the island Rangalifinolhu, one of the island's two twin islands that make up Hilton Maldives Resort & Spa. This re-development, including the creation of 79 villa termewah beaches in the country, development and Spa Village, the resort complex that includes a spa, restaurants, and exclusive villa . 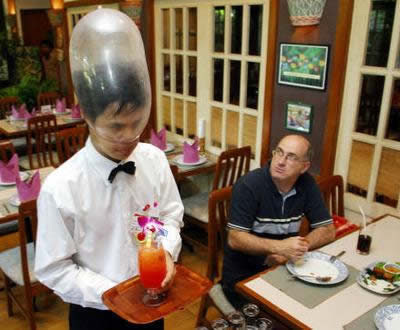 "Cabbages and Condoms" restaurant is located in Thailand. Be spread condom decorate the walls, even the carpet has the condoms sign. Does not offer after-dinner mints, the waiter also offer condoms in the counters. Profit obtained by this restaurant donated for Population and Community Development Association (PDA). D.S. Music Restaurant is located in Taipei, This is a restaurant with a medical theme, decorate the entire wall. the waitress dress up like a nurses, and your drinks served from the infuse bottle! A restaurant owner get this idea from experience that when he can be treated either at the local hospital.